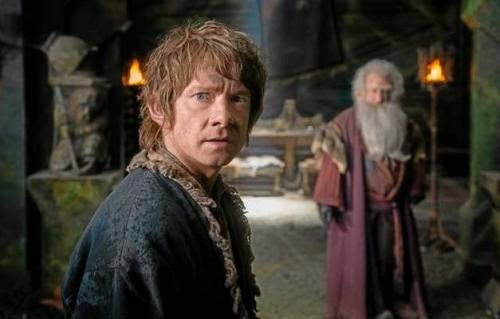 Nearly all the film analysts here at Critics at Large have taken a crack at the second of Peter Jackson’s fantasy trilogies centering around Bilbo Baggins (Martin Freeman) and his colourful, high-energy adventure through Middle Earth to The Lonely Mountain (and back again). While my colleagues have enjoyed the movies overall, they've rightly censured the films for the flatness and protraction of their battle sequences, their over-reliance on CGI and technical gimmickry, and the folly of trying to stretch a small adventure novel into a blockbuster trilogy. Peter Jackson's hardly a perfect filmmaker, and one could argue that this latest trilogy of bloated epics is the least worthy of his works (although I would hope that those who’ve seen The Lovely Bones would beg to differ). I don't think many of these directorial choices are necessarily good ones, but as a filmgoer and (an admittedly rabid) franchise fan I must take what I'm given. 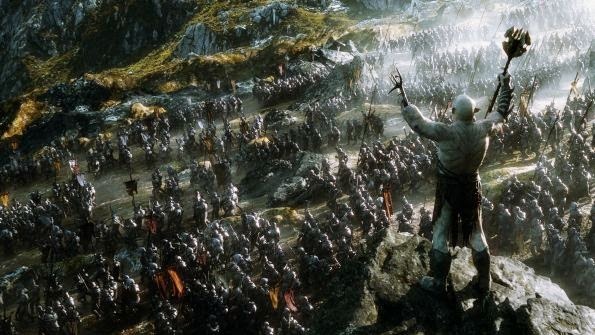 So: how well does The Battle of Five Armies do what it sets out to do? Quite well, as it turns out. As the concluding chapter of the Hobbit trilogy, it falls to Battle to resolve the storylines established in the first two installments, while also providing the Lord of the Rings: Return of the King-style action spectacle that audiences expect, and it does this with zeal. The shortest of the Hobbit films – leaner than its sister flicks by twenty minutes – it keeps the visual razzle-dazzle at maximum and provides nearly forty minutes of uninterrupted fighting action, almost all of which is highly motivated and comprehensible – no mean feat, considering the volume of material Jackson covers. After having stolen the Arkenstone from the dwarf fortress of Erebor, Bilbo (Freeman, playing the hobbit to perfect Shire-friendly pitch amidst the fray – this is not the jaded, world-weary Frodo at the end of Return of the King, who cannot remember the taste of strawberries; this is still his fussy uncle who has had just about enough of all this adventure nonsense by now, thank you very much) must stop Thorin Oakenshield from succumbing to “dragon sickness” and leading their band of brave companions into an unnecessary war between the men of Laketown, the Elves of Mirkwood, and the Orcs who have come to kill them all anyway. (Though who exactly these “five armies” are is unnecessarily confusing. Nobody ever precisely enunciates each fighting force in list form, so the audience is left counting on their fingers in an effort to keep up.) The elder forces of Middle Earth – that is, the senior citizen’s brigade of Gandalf (Ian McKellen), Saruman (Christopher Lee), Galadriel (Cate Blanchett), Elrond (Hugo Weaving), and Radagast (Sylvester McCoy) – contend with the larger threat of Sauron and his Ringwraiths, which bridges the gap from these films into the LOTR trilogy beautifully. 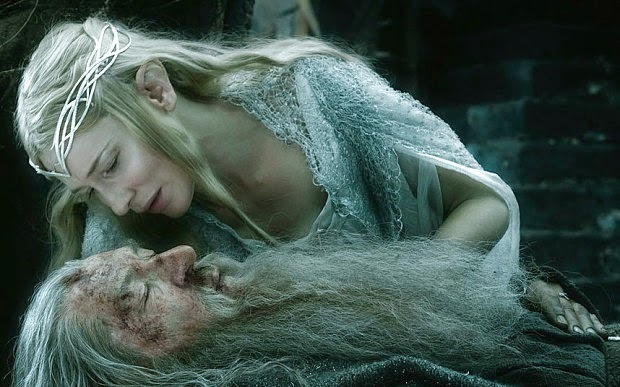 Scenes of sublime resonance stand out from the carnage, offering shades of the brilliance of The Lord of the Rings: Legolas parts with his father Thranduil, who offers a touching conciliation about the elven archer’s long-dead mother; Dwalin, ostensibly the least sensitive among the dwarven company, watches in pain as his king and dear friend Thorin is driven mad with greed; Bilbo is given the coat of mithril that will eventually save Frodo’s life in a scene that begins tenderly and ends with twangs of sinister derangement; and perhaps my favourite, Bilbo’s belongings are auctioned off at the entrance to Bag End, the residents of Hobbiton believing him dead and seeming not to recognize him even as he stands before them, resplendent in the spoils of his adventure. Jackson provides these small reminders of his skill at coaxing powerful performances out of actors in heavy wigs and makeup, none of whom – as Shlomo pointed out in his review of An Unexpected Journey – ever condescend to the material. High fantasy works best when it’s treated as reality, in which the vulnerabilities and weaknesses of ordinary people are exposed by their extraordinary circumstances (George R.R. Martin’s A Song of Ice and Fire being the other prime example). In this case, as it was with Interstellar, my cynicism must be tempered with acceptance.The difference, I think, between these and the odd choices of other directors is intent. There is only one noticeable instance of cringe-worthy pandering in Battle of the Five Armies (the shoehorned reference to "The eagles are coming" from The Return of the King) – but unlike other big-budget filmmakers such as Michael Bay or Roland Emmerich, Peter Jackson does not regard his audience with contempt. He simply asks that you completely suspend your disbelief – which I admit is asking quite a lot, considering the film’s rock-worms, battle pigs, and slapstick humour riding on the heels of decapitations and death – and come along with him on his wild ride. You might question some of the choices he makes in his adaptation of Tolkien's novel, and that's valid. But if you are able to immerse yourself in his universe, in his luscious, gorgeously-realized vision of Middle Earth, and let go of your connection to the cynical world from which he wants to help you escape, you can't help but be swept along. I'm not saying these films should be immune to criticism, and I'm certainly not saying they're without fault. But I leave you with a question: who else is making broadly-enjoyable adventure fantasy epics of this operatic scale but Peter Jackson? Who else invests those worlds with as much genuine passion and craft but the wizards at Weta Digital? Who would you turn to as a replacement – the dour, cerebral Christopher Nolan? The flashy, brainless Zack Snyder? Or, heaven forbid, Ridley Scott, who selects terrible screenplays and seems unwilling or unable to leverage his talent as a director? I recognize that the Hobbit trilogy is not for everyone, but I ask you: who else would you trust to do it any sort of justice? It's awfully easy to complain about plot holes and pacing issues in such wondrous films when there are no alternatives. 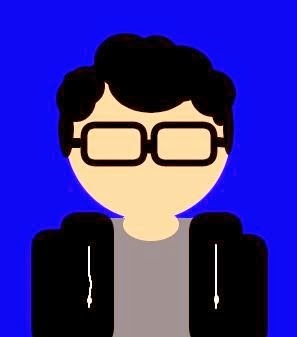 I think Jackson deserves at least a little bit of slack, if only because he’s the only one doing this stuff, and doing it (mostly) right.